Combine To Form Rat King! This week’s Grimm gives nearly equal time to the crime of the week, which is a pretty interesting one, and the wesen conspiracy story, and it all goes by pretty quickly. Plus, viewers finally get to see something that’s been only talked about until now. Spoilers after the break. 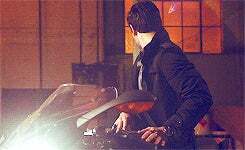 As they often do, Grimm picks up right where last week’s episode ended, with Trubel showing up at Nick’s maybe-not-so-secret doorstep bruised and battered. Nick brings her in, gets her in his car, and lets Adalind know he’s driving her to the hospital. He checks her in, and when the doctors ask why she’s wearing body armor, he tells them she’s an undercover police officer. Which I’m sure he can get Renard, Hank or Wu to back up, but it doesn’t seem to come up. After making sure she’s ok, he heads to the waiting room. Then, being a detective, he goes through her jacket, noticing some punctures in it, and a few forms of ID and cash, for varying countries. And she has one of those phones requiring a finger print to unlock, just like Chavez. While Nick is at the hospital, Adalind sees the Chavez phone ringing and decides to answer it in case it’s important, and ends up talking to someone asking about Trubel. He recognizes her voice and when he says her name, she realizes it’s Meisner, at which point he hangs up. She gives Nick a call, but he decides it’s best not to talk over the phone. After he makes sure Trubel is stabilized, Nick gives the hospital staff her Lauren Cole name, asks to be updated as soon as she wakes up and then heads back home. But we also need a case for each episode, so that gets started when 3 boys who seem up to no good head out in a pickup truck, mentioning something about getting a tail for a trophy, while the girlfriend of one of them insists they stay home. It turns out they’re going to a local junkyard, or dump as some call it, to chase what turn out to be reinigen (rat-wesen), because they’re klaustreich (cat-wesen) and they can’t act civilized and ignore their animal instincts. They catch one, but when he manages to grab a bottle and smash one of the boys in the head, they get angry, woge and start beating him while he begs them to stop. They really should have listened and left him alone. A large shadow creeps over the boys as they beat their poor victim, but only one of them notices it soon enough to escape, and he runs off as he hears his friends being killed. 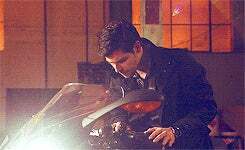 Back home, Nick and Adalind compare notes, and she tells him it was Meisner on the other end of the phone, and he decides to check out Trubel’s motorcycle that he brought in. 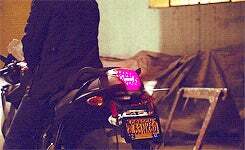 He takes a picture of the license plate and asks Hank to run a check, which he delegates to Wu. It’s registered to a Lauren Cole, who Wu notices looks a lot like Trubel. The motorcycle is a very expensive one, costing hundreds of thousands just for a base model, and while check it out, Nick learns this is more than the base model. There are switches in it, and when he tries one it shoots out 4 crossbow bolts. Two hit some paint cans, and two hit a wall. Back at the hospital, the nurse comes in to check on Trubel and tries to get her to wake up, even resorting to slapping her a few times.. Looks like she’s not too concerned with her patient’s well being. Once Trubel opens her eyes, the nurse woges, revealing herself as a wendigo, and we finally get a look at those Grimm eyes that freak out the wesen so much. Personally, I think it was better when it was left to the imagination, because there’s only so much you can do with effects, but it’s still nice to see, and a pretty cool look. The nurse then calls someone to confirm they have her, and ups her sleepy medication. Nick returns to the hospital, and is concerned that Trubel isn’t awake yet, but the doctor assures him she’s fine, but maybe needs more rest. Then he and Hank get a call about some dead bodies and it’s off to work on a case. Wu leads them to the crime scene and they’re all thinking wesen. While searching the bodies, one of them gets a phone call, from his girlfriend, and Nick and Hank head to her house to see if she can help with more information. She gets upset and woges, Nick calls her out as a klaustreich, she freaks out, he assures her he’s just working a case, and she tells him her boyfriend and buddies went to the dump to chase some reinigen, so they know someone moved the bodies. Before Nick and Hank get there, some reinigen go through what is a pretty cool hidden door in a refrigerator, where we see the boy who was beaten is dead, and is also referred to as “the prince”. Nick and Hank confront one of them, who is not the least bit intimidated upon seeing a Grimm. And Wu has checked the address of the surviving klaustreich and found the place trashed. We get a quick cut to the other side story, with a commercial for a mayoral candidate, which he and his campaign advisor are showing to Renard, to ask for his endorsement. They mention they’d like him to become Chief of the Portland PD, which he seems intrigued by. Nick and Hank head to the spice shop to find out if Monroe or Rosalee know how a reinigen would overpower 3 klaustrike and they mention the only thing they can think of is the Reisenrate, aka le Rangeau Roi, or Rat King. But it’s just a myth, and there’s no way it’s real. But the books in the basement have some pictures and information, including that some reinigen are so genetically similar when they woge, that they form one giant creature. So basically, a Voltron of rat-wesen, a term that sadly no one on the show actually uses. While they’re researching, Nick gets a panicked call from Selina, the girlfriend of the victim. Her last surviving friend had shown up at her house, panicked from the fear of knowing the Rat King is after him. The Reinigen show up, knock down her door and take him and Selina while she’s on the phone with Nick. So it’s time to head to the junk yard and Monroe and Rosalee volunteer to go with them. Rosalee finds the secret fridge door, and they find the 3rd klaustreich boy already dead. But Selina is still alive, so they untie her and make their escape. The reinigen all start crowding around, and aren’t concerned when Nick announces they’re under arrest for murder. They demand he turn over Selina who yells out she didn’t even do anything, but they’re not willing to be reasonable. They all run back to combine to form the Rat King. After Hank hits it with his shotgun and it doesn’t seem to have even stung, they run away, and lure it near some power lines. Hank then shoots one of them, and the Rat King is electrocuted, and falls back into separate reinigen. Clip and stills below. So now Nick can arrest a few of them for the murders, and make sure they’re in separate cells. Selina is upset that they killed her friends, but Monroe points out, like he does, that they’re the ones who went reini-bashing. At the hospital, the doctor had told Trubel he’ll need to operate on her brain, and they’re getting ready to move her. Meisner shows up at Nick’s new place, thanks to a GPS tracker on the motorcycle, and when she sees him, Adalind lets him in, and they have a talk, but he neglects to mention that Diana is safe. He calls Nick to tell him Trubel is in danger, and he needs to know what hospital she’s in. Nick tells him and says he’s on his way too. It turns out the doctor is also one of the bad guys, and they’re taking her down some corridors and an elevator as Nick and Meisner race to get to her. They do, and we get a pretty good fight to watch. I think it’s safe to guess that Meisner is going to be the one walking out of that elevator. But in the meantime, Nick has gotten Trubel safely to his home. Once she’s squared away, Nick asks Adalind to tell him everything she knows about Meisner. And that’s where it ends. Nick’s secret hideout apparently isn’t so secret. I’m guessing there’s also a GPS tracker on Chavez’s phone, and that’s part of the reason Meisner asked him to keep it. 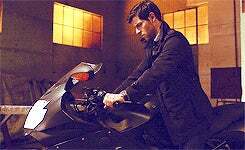 That is a pretty cool motorcycle. And Trubel had some serious armor on her when she was brought in to the hospital. As I mentioned above, I like that they finally showed us Grimm eyes, but it was never going to be as good as leaving it to the imagination. But what did you all think of it? If not “the Voltron of wesen”, I also would have been happy with “the Devastator of wesen” being a line that was spoken. Wu’s line about the other kind of trouble was good.